A Splash of Floral Sunshine! Bright, summery and cheerful, the Spring Siesta will create a bold and vibrant focal point in any setting. 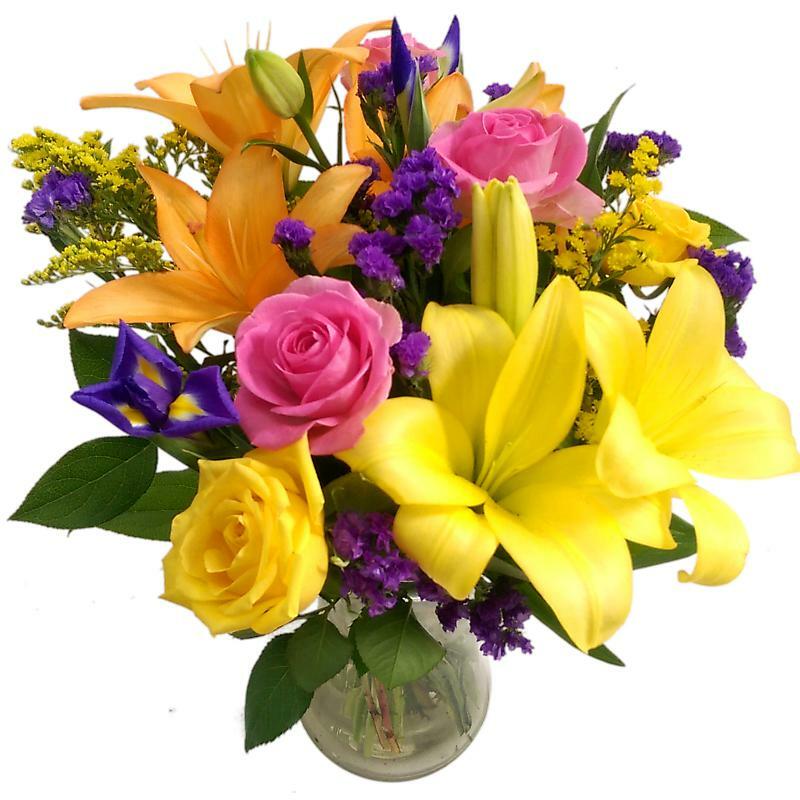 Composed of yellow and pink roses, alstroemeria, lilies and other seasonal stems, this exuberantly colourful bouquet will cheer anyone up instantly. Great as a unique and memorable gift, the Spring Siesta can be sent to loved ones for birthdays or anniversaries or as a way to say thanks, good luck, or congratulations. Or why not treat yourself to this eye-catching floral arrangement - it's sure to look incredible placed on your windowsill or coffee table. Your hand-tied flower bouquet will be delivered in our specially designed delivery box to ensure that they arrive in flawless condition. Whilst in transit we keep your stems wrapped in hyrdroponic gel which keeps the stems hydrated until you can get them trimmed and into a fresh water filled vase. Free next working day delivery is included as standard. If sending as a gift to a loved one, why not include a Handwritten Greetings Card, a box of Chocolates, a vase or a Teddy Bear as a special treat.